Playing Career : Melbourne (1957-62) 93 games, 1 goal. 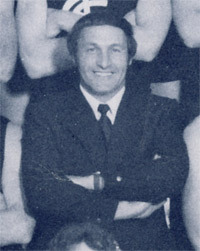 Carlton’s assistant coach Ian Thorogood was thrust into a hot seat on the Thursday night prior to the start of the 1976 season, when John Nicholls shocked the club by announcing his immediate retirement as senior coach. Thorogood stepped up to the position, and five months later, took the Blues to within one kick of qualifying for the Grand Final. A three-time Premiership half-back at Melbourne in 1957, 1959 and 1960, Thorogood was regarded as disciplined, reliable, brave and consistent - qualities that made him a favourite of legendary Demons coach Norm Smith. After 93 games played exclusively in defence for Melbourne, Thorogood retired in 1962 to accept the position of captain-coach at VFA club Waverley. In 1965, the Panthers defeated hot favourites Port Melbourne by 12 points in a hard-fought First Division Grand Final. The same two sides played off again in 1966, but this time the Borough proved far too good. Four years later, Thorogood returned to the VFL as assistant coach to Norm Smith at South Melbourne, and by 1975 he was established at Princes Park in support of John Nicholls. Still smarting from their quick exit from the finals the previous year, the Blues were committed to making amends in 1976, despite the shock of Nicholls’ resignation. Thorogood eased smoothly into the senior coach’s role, winning plaudits for the way he quickly stabilised the focus of the players, and by mid-season, Carlton was on top of a ladder crowded on the upper rungs. Although disappointed by a draw against Footscray in round 22, the Blues took out the minor premiership. Then, just a week later, the team stumbled badly against Hawthorn in the second Semi-Final, and lost by 17 points. This set up a Preliminary Final meeting with North Melbourne, where, in an epic clash, the Roos kicked three goals to two in the last quarter to win by one point. For the second year in a row, Carlton had been bundled out of the finals by successive defeats. Thorogood was retained in 1977, and with a group of exciting youngsters including Jim Buckley, Wayne Harmes and Ken Sheldon making their way through the ranks, the Blues were confident of climbing that one last step come finals time. Unfortunately, that chance never came. Although the team stayed camped in the top five for most of the season, another loss to our nemesis Footscray at the Western Oval in round 22 dropped the Blues to sixth place. Carlton was out of the finals, and shortly afterward, Ian Thorogood was out of a job. Contributors to this page: PatsFitztrick , molsey , WillowBlue , slow_mo , Jarusa and admin . Page last modified on Friday 18 of January, 2013 12:38:55 AEDT by PatsFitztrick. 1983 - Kernahan ready for VFL (28/07/83).